Using our sample performance evaluation template, it's the responsibility of every supervisor to invest adequate time to fully prepare for every coaching discussion or performance review. 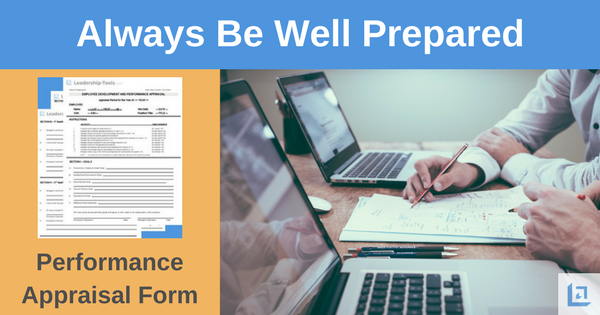 Yes, you owe it to your employee to be well prepared! This is especially important for the annual review, which is the one time each year that a manager can truly emphasize the value that the employee has added to the team over the past year. Sadly, too often this opportunity is not fully leveraged. Annual performance reviews provide a unique opportunity that, if not fully prepared for, can send a terrible message to an employee - a message of "I don't really care about this process, or you." Managers who have not adequately prepared, are quickly seen by their employees as being uncaring and self-centered individuals. I once had a supervisor who was always late in conducting my annual performance review. Rather than continue to wait, I took the initiative of writing the review myself, as if she were writing it. I presented the review to her explaining that I knew how busy she was and rather than just provide her my self assessment, I took the liberty of writing the review as if it were coming from her in hopes that this would save her time. She was probably a little embarrassed because she knew she was late in completing my annual review. However, I genuinely think she was relieved that I did so much of the work for her. About a week later she handed a slighted edited version of the document back to me saying what a good job I had done in preparing the document. She added her final rating and a signature to the document. That was it -that was the extent of my annual review. I was stunned! She didn't even take the time to sit down with me to discuss the goals for the coming year or invest any time in talking about my career aspirations. None of that apparently mattered to her. Long story short, I ended up repeating this process for the next 4 years, until I moved on to a new position in the company. As evidenced by this article, I never forgot how unimpressed I was with her as a leader. I'm sure she never considered the poor message she was sending to her employee. For her, this was just one less thing she had on her plate. I swore that I would never send that message to any of my team members, which is why I always take the time to fully prepare for a quality discussion during all coaching sessions or performance review discussion. Using our sample performance evaluation template, you can do the same. "It's not the will to win that matters. Everyone has that. It's the will to prepare to win that matters." 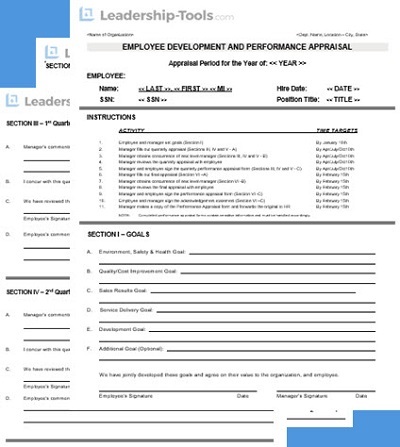 Ask employees to complete a self-evaluation while you are preparing your own assessment. Their comments will add additional insight that will make the final appraisal document a collaborative effort, and therefore more valuable to the employee. Arrange for a mutually convenient time and location. Ensure there will be no interruptions. Consider this time with your employee as sacred. They will appreciate getting your undivided attention. Fully review the performance appraisal draft. Have it fresh in your mind before meeting with the employee. Review each performance rating and the facts supporting each rating. Develop an agenda or outline for the discussion. This will keep the discussion focused on substance and make the most of the allotted time. Completing our free sample performance evaluation template will help you in this effort. Anticipate reactions. Be prepared to know how you’ll respond in the event of an employee becoming defensive, angry, silent, sad or non-responsive. Do not discuss any item for the first time during the annual review. There should be NO SURPRISES during the review. If you have effectively communicated throughout the year, this review will simply be a summary of the entire year. The only big surprise the employee should experience is news of a promotion or increase in pay! Positive surprises are always welcome, but negative surprises are not appropriate. Role play any difficult discussions you may need to prepare for. This will help you to be more fully prepared for any difficult discussions. Keep comments focused on performance or behavior, not personality or personal judgements. Managers who take the time to prepare and conduct an appraisal the right way, are rewarded with employees who are more energetic and enthusiastic about their work. Employees who feel they are appreciated and treated fairly, will be around longer as they will be more fulfilled in their roles, knowing they have a supervisor that is committed to their success. Remember, success in all things, is the result of being prepared. Using our free sample performance evaluation template will help to ensure that you are well prepared for your coaching sessions and performance reviews. The fifth topic in our six-part series highlighting our on sample performance evaluation template explains the importance of will address the critical issue of Setting Performance Goals during the employee appraisal discussion. This is the perfect time to address both prior performance to goal, and objectives for the coming year. To download our free sample performance evaluation template, simply subscribe to our free newsletter. You will immediately receive a password that grants access to our entire leadership tools library.